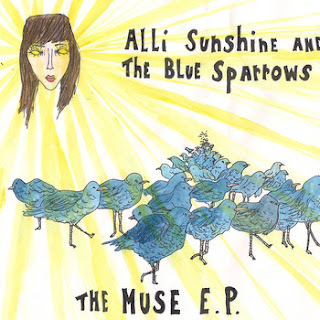 Alli Sunshine and the Blue Sparrows offered up The Muse E.P. this past December. Now I should have spread the word on this earlier, but hey, we're here now! I've been listening to this album quite a bit over the past month, and Nanaimo certainly has another group to be proud of. This is an excellent 5 song showcase that has me eager to hear (and see) more. Alli Sunshine has a beautiful voice, which easily keeps your interest itself. The instruments are equally great, and I enjoy the diversity of the 5 tracks. "House of Hanover" and "Baby" are my favourites, I can't choose between the two. "House of Hanover" is a gorgeous song, a slower pace that really let's you enjoy Sunshine's brilliance. "Baby" has a super fun guitar solo that makes me love the entire album. The whole song is fun to hear build, and I just really enjoy how it leaves me feeling. The Muse E.P. is worth your time for sure. The group sounds wonderful, and I think can safely say this is a job well done. All 5 songs create an interest to hear more. A great Vancouver Island group that will be worth watching out for.